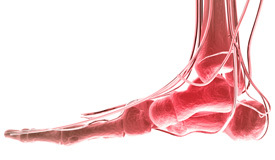 Plantar fasciitis is one of the most common podiatric conditions relating to the foot. It is when the thick tissue on the bottom of the foot (the plantar fascia) becomes inflamed and irritated, making it difficult to walk. This is most often the result of repeated episodes of minor but recurring injury, such as with frequent running or long periods of standing. The pain can be located in the heel area of the foot or in the arch. It is often worse in the morning due to stiffness of the tissue, and also becomes worse after long periods of walking. The pain often decreases with rest. Dr. Taormino will examine your foot for swelling, redness and tenderness of the area. X-rays may be taken. For more information about Plantar Fasciitis or to schedule a consult with Dr. Taormino, call our Ronkonkoma, NY office at Ronkonkoma Office Phone Number 631-467-2813 or our Shirley, NY office at Shirley Office Phone Number 631-281-6882; you may also use our Appointment Request form. This reviews section is in progress. Please visit the Patient Review Form page to leave a review about your treatments for Plantar Fasciitis with Quality Foot Care. Call our office if you would like more information: Ronkonkoma Office Phone Number 631-467-2813. 5 out of 5 stars based on 5 Plantar Fasciitis reviews. Dr Taormino diagnosed me quickly and better than anyone I had previously seen, recommending me to a neurologist for pain in my heel possibly caused by a back issue, as opposed to plantar facistiis. Much thanks to him and his staff. Great staff and very knowledgeable. Appreciated the time taken with me to resolve my issues. Love the dr and his wife staff Kim was extremely helpful. Dr. Taormino was truly amazing. It was my first visit and he was extremely thorough and explained how I can help adapt my lifestyle accordingly to compensate for the issues with my feet. I would highly recommend to anyone.